Part of the map by the Albrecht Group. 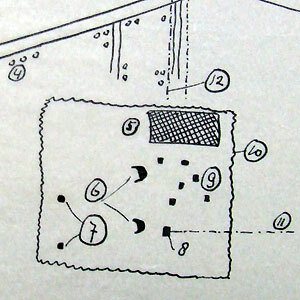 Drawing by the Albrecht Group of a Wurzburg-Riese radar near Weert (Southern Netherlands). Here problems with the measurements also? Several resistance groups were active, some solely focused on intelligence gathering, during the years of German occupation of The Netherlands. Below are a few texts found in the reports of these groups which were sent to London. The information is used in the other pages. 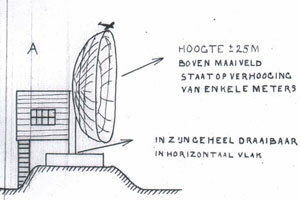 "A structure near Weesp was built with two parabolic antennas and one rectangular frame, similar to other locations (Harderwijk for example). A wooden tower was put up also, the shape is yet unknown."